The Sumorin Totma Icon of the Mother of God was glorified by numerous healings at the Spaso-Sumorin monastery of the city of Totma. When the inhabitants of the city turned to Tsar Ivan the Terrible for permission to build a monastery in their city, the Rostov archbishop Nicander in the year 1554 bestowed upon St Theodosius the grant for building. 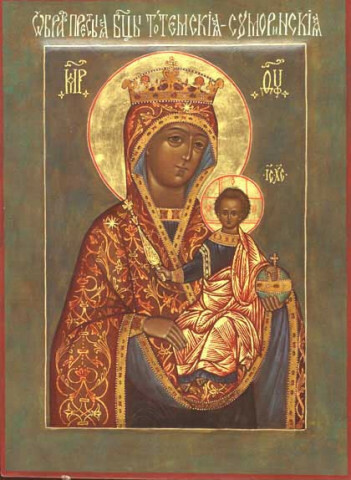 The igumen of the Priluki monastery blessed St Theodosius with an icon of the Mother of God for success at building the new monastery. The icon thereafter received the name Sumorin Totma (Sumorin is the family name of St Theodosius, and Totma is a city). After the death of the monk, the wonderworking icon was put in a case in front of the crypt of the saint at the Ascension church of the monastery. St Theodosius has appeared to many of the sick, holding this icon in his hands. The Sumorin-Totma Icon of the Mother of God gained renown in the Holy Savior-Sumorin Monastery in the city of Totma. In 1554, after the city residents had appealed to Tsar Ivan the Terrible for permission to establish a monastery in their city, Archbishop Nikandr issued a building certificate to Venerable St Theodosius. The abbot of the Prilutsk Monastery blessed the Venerable One with an icon of the Mother of God to have success in building the new monastery. The Icon became known as the Sumorin-Totma Icon (Sumorin was Ven. St. Theodosius last name.). After the death of the Venerable Miracle-worker, the Icon was placed in a shrine before his reliquary in the Monastery's Holy Ascension Church. Notably, Venerable St. Theodosius appeared to many people with that Icon in his hands.